Are you searching for a beautiful underwired nursing bra? If so we highly recommend the Lorna Drew Grace Cream and Dove Flexi-Wired nursing bra. We think the detail on this bra is amazing so you should look and feel really feminine. So what makes it so pretty? It has gorgeous French lace which contrasts beautifully over the light foam cup. You may also really like the silky satin bows. 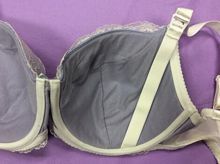 How about the structure of this nursing bra? Well, it has a fantastic shape and has the gentle flexibility of a soft nursing bra. It has graded straps for your comfort if you pick one of the larger sizes. You should find the cups to be super soft and comfortable as they are pure cotton lined. What about the wire in this nursing bra? Well, it is made of woven micro strands which knit together. These will give you a strong yet incredibly flexible underwire. The wire is flexible to ensure it adapts to your changing shape. How do we think it will fit you? It has extended hook and eyes. This means that as your body grows or contracts, you can adjust the bra for a really nice fit. It has a Balconette Bra shape. How will it work as a nursing bra? We think you will like how easy it is to open and close the clips on this bra. Also the drop down clips provide a shelf support to make breastfeeding easier for you. So why do we think you will love the Lorna Drew Grace Flexi-Wire nursing bra? We love it. It looks gorgeous, offers good support and we think you will feel really comfortable in it too.